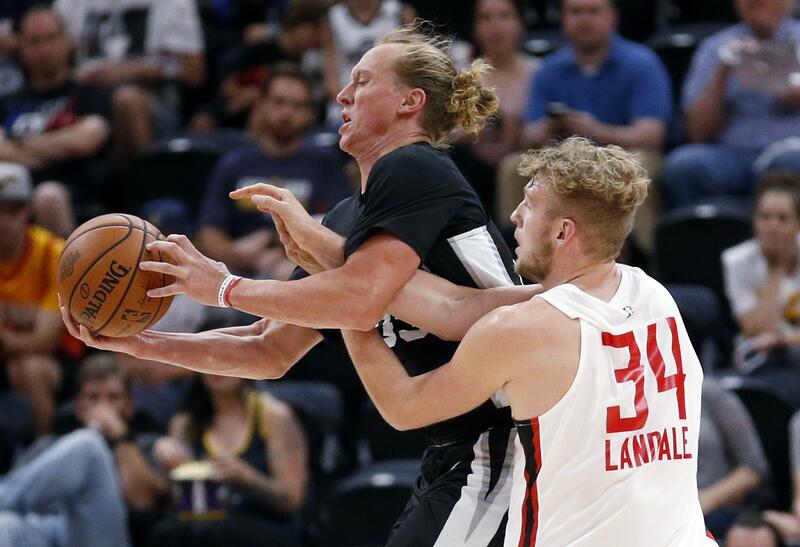 UPDATED: Tue., July 10, 2018, 8:02 p.m.
LAS VEGAS – Jeff Ledbetter added to his already impressive Summer League campaign, scoring 10 points and dishing out four assists, but his San Antonio Spurs fell to the Portland Trail Blazers 95-89 on Tuesday at Cox Pavilion. Ledbetter, a former standout at Idaho, also grabbed two rebounds in his 20 minutes off the bench for the Spurs. Ledbetter has scored 51 points in six Summer League games between Salt Lake City and Las Vegas. Ex-Gonzaga big man Zach Collins did not play for Portland. Gary Trent Jr. scored 20 points to lead the Trail Blazers. Wade Baldwin IV scored 16 points and Jake Layman scored 15 points for the Trail Blazers. Portland made 11 of 21 threes and outscored the Spurs 24-11 at the free-throw line. Jaron Blossomgame and first-round pick Lonnie Walker IV each scored 12 points and Olivier Hanlan and Trey McKinney-Jones added 11 for the Spurs. Ike Iroegbu (WSU/Kings): 5 minutes, 1 rebound, 0-for-1 FG. Johnathan Williams (GU/Lakers): 23 minutes, 9 points (3-for-5 FG, 1-for-2 3-pointers), 2 rebounds, 1 block. Published: July 10, 2018, 7:54 p.m. Updated: July 10, 2018, 8:02 p.m.